Highlights: See the sights of Washington, D.C. aboard a new open-top double-decker bus. 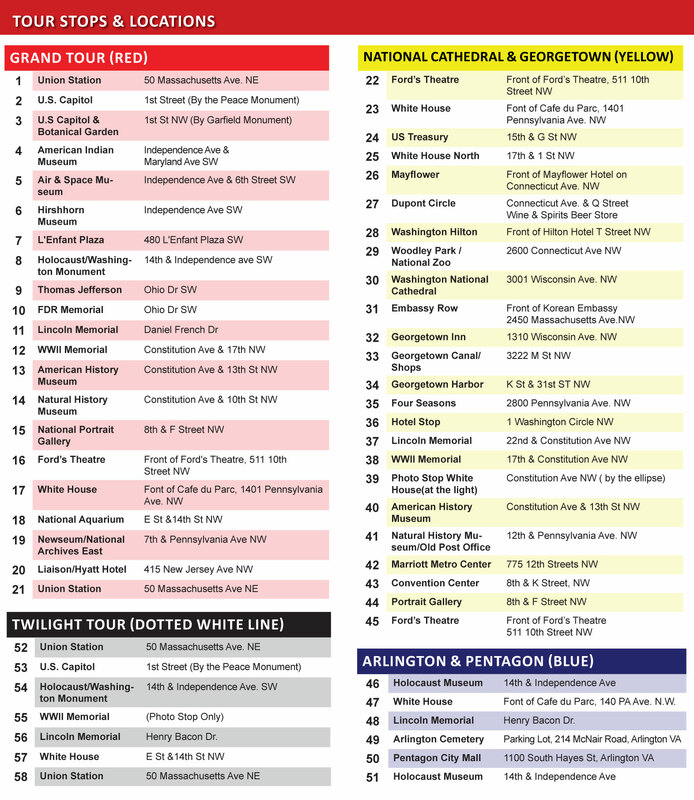 This tour operates as a hop-on, hop-off tour that encompasses 25 stops throughout the nation's capital. Enjoy the luxury and comfort of our new equipment with the added benefit of a two-day unlimited use ticket. It was the best way to take Hop on and hop off to see the most wanted places. I'll recommend it to my friend when they travel to Washington DC. One suggestion is to extend the tour time to 7pm. Come with us to hear all about the people and places that make up the nation's capital, from the legacy of Abraham Lincoln to present day Washingtonians, from historical buildings to modern urbanism. And of course, an entertaining and informative narration to bring the sights to life! Kids and adults alike enjoy the excitement of riding atop a double decker bus with breathtaking views of the city sights. 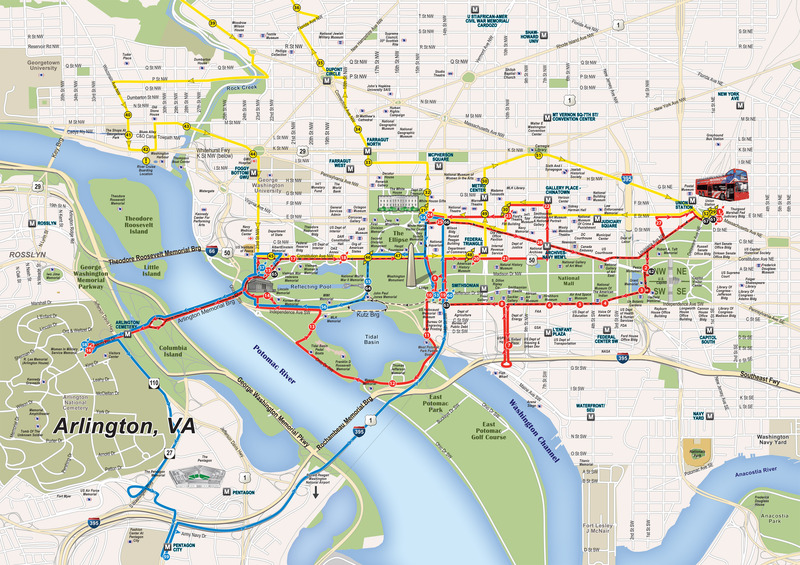 Transportation and attraction in one, it's the perfect way to explore DC at your own pace! Red Line, Yellow Line, Blue Line and Dotted White Line are available. The full circle takes approximately 2.5 hours to complete. Enjoy these sites and many more within walking distance. Book now and save! There will be major detours on the 4th of July. Big Bus will be running the purple loop only. The purple loop is the red and yellow loop combined. Unfortunately, Taketours has no control over these road closures. We will do our best to ensure that you still have an opportunity to explore the city of Washington, D.C. We hope that these road closures do not inconvenience you too much as you can still enjoy your sightseeing experience with Taketours. 24 or 48 Hour Hop On Hop Off Pass: Unlimited access from 9 AM - 6 PM for the duration of your pass. Please note that when you purchase tickets, your voucher will have a departure time of 4 PM; that just identifies the last bus departure time of the day. You can board the bus at any of the stops, any time after the first bus departures in the morning at 9 AM. Your 24 or 48 hours will begin when boarding the bus and exchanging your voucher for tickets. Deluxe Tour (48-HOUR) Includes Red Loop,Blue Loop,Yellow Loop. Patriot Tour(24 HOUR)Includes Red Loop. Unlimited Hop-on Hop-off for 24 Hour period. Joining George Washington in his boat crossing the Deleware River and sitting next to Franklin D. Roosevelt to hear a fireside chat are among the interactive experiences awaiting guests of Madame Tussauds Washington D.C. It's the ultimate three-dimensional tribute to the United States' commanders-in-chief and American history. The spectacular new Madame Tussauds D.C. gallery is the only place in the world where you can see and interact with all 44 U.S. Presidents. The National Museum of Crime & Punishment provides America?s most thorough and comprehensive study of the development and evolution of crime and punishment in a museum environment. Five unique and distinct galleries delve deep into the studies of criminal intent, criminal profiles, serial killers, issues associated with crime, the prison system, victims, crime prevention, CSI/Forensic science and more. Umbrellas are pistols. Dead rats are microphones. Femme fatales are men fatales. Gain access to a wild world of gadgets, weapons, bugs, cameras, vehicles and spy-tech that defies classification. Do you have what it takes to live a life of lies as a spy? The answers are exhibited here for those who are clandestinely curious enough to enter. Discover America's Aquatic Treasures? at the National Aquarium Washington DC, located in the lower level of the Department of Commerce Building. The nation?s first Aquarium offers a 45-minute intimate showcase of unique and engaging animals and a refreshing pause in your busy day! Don't miss this historical landmark and enjoy the beauty of over 250 species including alligators, piranhas and sharks. Special animal presentation and feedings daily at 2pm. Be yourself, speak your mind and let rock-n-roll do the rest. Complete your tour of the city with an authentic rock-n-roll dining experience. You'll be surrounded by 17 plasma displays as you dine with the stars and marvel at our world famous collection of memorabilia. Includes a deluxe cheeseburger, fries and a drink. Hard Rock Cafe Washington, DC where you don't have to BE a rock star to party like one! Operating Times: Daily - First departure is at 9am from Union Station and last departure is at 4pm, also from Union Station. Features Include: Air conditioning, best views from rooftop 13 feet high with no windows, comfortable seats, most stops of any company, frequent departures, entertaining and learning narration, ticket valid for unlimited 2 days, 2 hour full tour of Washington DC, and children under 4 ride free. This was a great tour. I have been to Washington DC many times. I didn't feel like walking so we caught the bus. Our guide Kenneth was wonderful. He was funny and told unbelievable stories for each attraction. I d id the night tour- it is something wonderful to see DC lit up at night. I had plenty of time to take amazing pictures. Sitting up top you get great pictures. It poured rain towards the end, but it was an amazing time. Tony was a great driver and they both kept us entertained. This is definitely worth it! It was worth the money! Has lots of stops, one of which was conveniently near our hotel. I just wish they extend their hours at least till 7PM. This way tourists can maximize time even more. And also I wish there was an actual stop at the Pentagon memorial, so we can visit it next time. Nevertheless, we plan to get the same tour next time we go to Washington. At least we don't have to worry about getting a ride to our next destination. The best way to go around and see the beautiful sights in DC. You'll see almost all the tourist attraction. Got on this on a Holiday weekend and on the first day of the season so traffic was horrendous-good tour and probably great service at other times but when I went it took almost five hours to complete the whole loop. However, you will probably see many spots that you would not venture to as a tourist. It was a great experience and best way to explore DC. Hop on and hop off is the best way to see the places of your choice.One suggestion is to extend the tour time beyond 5 PM so you can take the full advantage of your 48 hrs pass. What a great way to get oriented and learn your way around Washington, DC! The tour covered the most wanted to see locations and the hop on hop off is a great idea!